Every now and again in life, we experience such a jolt, such a step-change in pace, culture and attitude, that for a moment our breath can quite literally be taken away. One such moment is stepping from New Zealand to Japan in one swift movement across the threshold of a Boeing 777. Gone is the slightly-forced Kiwi languidity and, suddenly, Japanese efficiency, purpose and precision engulfs you with full surround-sound force. Our pusher has us off at break-neck speed towards the shuttle train, a 5’6” human dynamo with little English beyond ‘passport’ and some numbers, but a demon with a wheelchair and a master of the lingua franca of hand signals, eye-brow raising and smiles. Employing the same communication medium, he picks up with ease that we’ll be ultimately heading for the hotel courtesy bus stop outside the terminal building, and weaves us through Immigration, Baggage Reclaim and Customs with alacrity and speed. The only disappointment being that, once we arrive at Bus Stop Number 25 for our free transfer to the ANA Crowne Plaza, he’s just as efficient at ejecting GCC from the wheelchair and leaving us at the seatless stop, as he ricochets off to scoop up his next inbound infirmity. Luckily, the burly Delsey and Samsonite double for a bench each and, with alarming punctuality, the Crowne Plaza bus rolls up as if controlled by atomic clock. 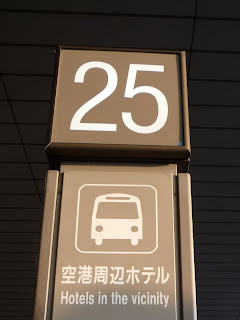 The transfer to the hotel is, for the first-timer, especially well-organised as it traverses its loop between each terminal at Narita, the hotel and back again to the airport. At every stage, recorded announcements in Japanese and English comfort the wary with clear indications of the next stop, estimated time of arrival and even a warning that, owing to the layout of road junctions, the hotel will be passed and then returned to – so not to panic. It’s an excellent set up. Depending on traffic (as the recorded message will, conscientiously, tell you) it’s about a 25 minute drive to the hotel from the airport, whereupon porters will unload baggage and hold it while check-in formalities are completed in the airy, hushed Reception. Continuing the theme of pre-emptive strikes of potentially-needed information, an airport shuttle timetable is provided with the room key and a flash of the key wallet reveals the room number to the Porter, who discreetly follows with the bags from the bus. The room, a corner Junior Suite with a view to the airport in the distance, was modern and stylish – only the positively antique television appearing incongruous in this room in the heart of Japan, the World’s leader in audio visual technology. The bathroom had obviously not felt the interior designer’s touch quite so recently, but was clean and functional, with the trademark Japanese bidet/toilet and positively abundant toiletries and amenities. Indeed the room does not go under-provided in this regard either. Robes are joined by Japanese pyjamas, and a special ‘sleep kit’ is placed between the beds, comprising self-heating eye masks and two types of green tea – one to induce night time slumber and one to reinvigorate the early morning. Having done little but slump on an aircraft all day, eating if not necessarily enjoying, there’s no great hunger gnawing at us and we forego an investigation of the hotel restaurant in favour of an early night in comfortable beds, with the curtains open to watch the lights of airport-approaching aircraft scan across the windows like shooting stars. Awake and bathed the following morning, the prospect of another day of eating and sitting renders paying for a pre-departure breakfast somewhat pointless, so instead the porter is called to collect bags and we make our way back to the light and spacious lobby to check out and board the next courtesy coach back to Narita. The porter gives us a tag to identify to our bags and their intended terminal and, having checked-out quickly and had a brief look around the lobby convenience store, the doorman takes our tag and lines the bags up ready for the next bus. Lest anyone in the hotel should be unaware of its impending arrival, a recorded announcement plays through the hotel’s PA system, and a few more guests scuttle from the restaurant to join us on the forecourt as the bus, now predictably, rolls up bang on-time. More on-board announcements accompany progress to the airport, warning of the necessity to have passports ready for a perimeter security inspection and advising estimated travel times to each terminal. It’s almost worryingly stress-free and, as soon as we roll up at Terminal One (punctually, of course) the driver is out and has our bags unloaded in a flash. Final Verdict for the ANA Crowne Plaza Narita: 8.0/10. I’m awarding this score carefully, as so few of the hotel’s facilities beyond the lobby, guest room and airport transfer were tested. That said, as an airport stopover hotel, it was pretty much perfect. The organisation of that transfer, the courteousness and helpfulness of the staff and the quiet, comfortable room all combined to make this an excellent choice for a single overnight stay and, on the basis of that, I think that it fully deserves an 8.0 and a strong recommendation.